I like to support theaters around town that show anime or non-mainstream animated films. Now that Video-to-go has closed their doors and the future of Shuto Con is in doubt, support for animation here in Lansing is flagging. Though even before, Mid-Michigan was pretty much a cultural wasteland with regards to animation. Even though Lansing Community College has an Associates degree in animation and Michigan State University has an animation minor, you'd think that there would be a much bigger animation scene, but no. In order to see some of the more popular animation releases from overseas (and Canada) you have to travel to Detroit or Grand Rapids. It's a sad state of affairs but it is what it is. You can't make people care about the things that are important to you. All you can do is get your message out there as loudly and as widely as possible so that like minded people will find your events -- and hopefully encourage more people to discover your interests. Which brings us to two of the local theaters: Celebration Cinema on the South side of Lansing and Regal Cinema on the West side of Lansing. For years now, these two theaters have done more to bring in animated films than others in our area. And even though I'm usually one of about six or seven people in the theater during the one (or two) exclusive screenings, their efforts are appreciated. With the bleak winter sapping my will to go outside, two movies made me make the trek through the snow this past January. The first was Modest Heroes, the second release by newly founded Studio Ponoc. This entertaining trilogy of animated shorts was created by the studio who brought us the anime adaptation of Mary and the Witch's Flower last year. And while 'Mary' really didn't speak to me, Modest Heroes ended up being the anthology film that I wished Studio Ponoc had released first. In the spirit of anime anthologies like Robot Carnival, Memories, and Genius Party, Modest Heroes is a series of unconnected short stories but with a theme that unites them all--that theme being spelled out in the title: everyday people rising to meet extraordinary challenges. "Kanini & Kanino" is the story of a pair of water faerie brothers who struggle for survival in their river home after their mother departs to give birth to the next generation of water faeries. "Life Ain't Gonna Lose" is the story of a boy dealing with a deadly allergy to eggs and how he rises to face the challenges of an environment that is innocuous to the rest of us but lethal to him. And lastly, "Invisible" tells the tale of an office worker who is so overlooked by the people around him that he literally becomes invisible. When a near-death experience leads him to question his worth to the world, he is suddenly confronted with the question: can a nobody like him rise above circumstance to become a hero? 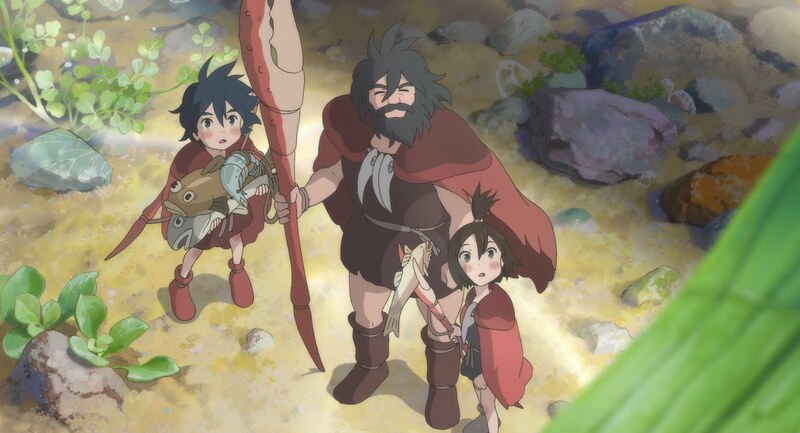 As with the initial offering from Studio Ponoc, the animation in Modest Heroes was first rate. All three stories were interesting and the characters were engaging. I'd recommend this anthology to anyone who loves short films. Best of all, after the screening, they played a video where Yoshiaki Nishimura, the film's producer, discussed the origins of these three shorts as well as the importance of making short films--especially when you're a studio that makes feature-length films. Hopefully, that video will make it into any future DVD releases. 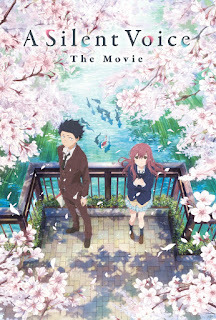 The second film that came to Lansing was the re-release of Koe no Katachi (A Silent Voice)--billed as the Shape of Voice for English audiences. Produced by Kyoto Animation and initially released in Japan in the same year as the mega-hit your name., A Silent Voice was brought back by Fathom Events and distributor Eleven Arts to North American audiences for a two-night run: one for the English sub and one for the English dub version. The night that the film was to be shown in Lansing, the polar vortex hit Michigan with a vengeance, yet I still made the run to the Regal Cinema (along with three other people). Eh, the snowplows were out and my car has both wide tires and traction control. Unfortunately, the Regal Cinema had decided to close for the day because of the cold and the snow. Dejected, but understanding the reason, I trudged home -- though I wish they had posted the closing on their website, social media, or on their answering machine. Would have saved me the drive. Within two hours, I received an e-mail from Fathom Events which included a refund for the ticked I purchased online. Still, I wanted to see this movie. It had done exceedingly well in the Japanese box office even against the your name. powerhouse and had won multiple awards, so I figured it was worth my time. So I went online and discovered that there was a Kyoto Animation channel on YouTube with the English sub version of the movie uploaded. I went on to watch the film eight times over the following week. Well, as fate would have it, it wasn't an official Kyoto Animation channel and it's been pulled down by YouTube due to copyright infringement -- and rightly so if it wasn't an official channel. 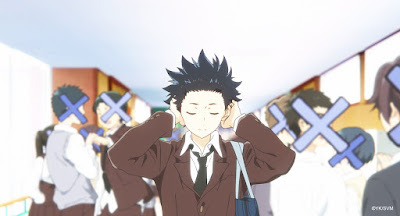 Fortunately for all of us who like to watch films AND make sure that the original content creator gets our money, Shout Factory is releasing A Silent Voice on DVD and BluRay on April 2nd in both English sub and dub formats (it will be a part of my collection... oh yes, it will!). However, if you can't wait until then, you can whet your appetite by watching the trailer below. In preparation for the DVD release, be sure to have a box of tissues handy. As I said, I've watched this movie eight times (yes, that amounts to a little over sixteen hours of my life -- sixteen hours well spent) and I got choked up every time I watched it (aargh... gak... the feels...!). This film is a story about personal struggle and redemption. When the arrival of a deaf girl disrupts the social balance of a middle school classroom, she becomes the target of bullying by the other students and complete indifference by the teacher. However, when the bullying is called out by her mother, one of her tormentors becomes the scapegoat for the actions of the entire class. Flash forward several years. The kids are now in High School and former bully Shoya Ishida is now a social outcast shunned by his fellow students, crippled by social anxiety, and haunted by the memories of his past actions. It is during this period of time that he decides to track down Shouko Nishimiya and make amends to her before ending his life. with the x's representing his inability to look at people face-to-face. I won't go into any more detail than the above because this is really a movie that should experience. There's a lot of nuance in the story and it's a lot more complex that you would initially think as it delves into the Japanese concept of redemption and doesn't shy away from the causes of bullying. This is a 'shades of grey' script that explores its concepts from multiple perspectives using the lives of well developed characters to provide a richly textured, multi-layered look at flawed people struggling to deal with the consequences of their actions. In the end, both films are well worth your time. I highly recommend watching both when they are released on DVD or streaming services. A Silent Voice is being released on April 2nd through Shout Factory. 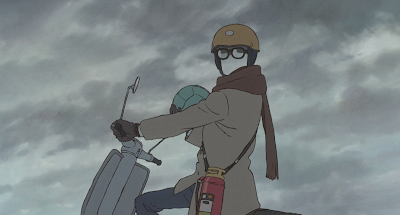 Modest Heroes was acquired by GKIDS for North American distribution, but no word on a DVD release as of yet. 1. 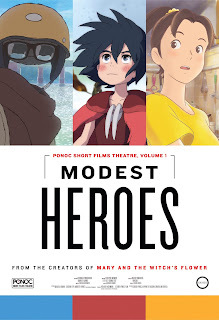 Modest Heroes images are from the press kit found on the GKIDS website and used with permission. 2. A Silent Voice images are from the press kit found on the Fathom Events and Eleven Arts websites and used with permission. I put Mind Palace by the Filmakademie Badem-Württemberg GmbH on my list of films to track down. Weekends won the Best Animated Short Subject award, and deservedly so. Always glad to see Gobelins, L'École de L'Image get some recognition. Even more glad to see Age of Sail get some recognition. Need to take a closer look at Google Spotlight Stories. Wow! Am impressed by what films they're preserving -- especially those Terrytoons films. Wish we could get a screening of those out here for our ASIFA chapter! Am pleasantly surprised to see how much mileage studios are getting out of older properties like Rocky & Bullwinkle, Mickey Mouse, and Tom & Jerry. The Blender demo reel was pretty impressive! Am baffled by how many awards Spider-man is getting. The animation in the trailers looks so choppy it's really distracting. Welp. That tears it. Gonna have to go see the movie for myself. Sometimes the jokes go on a little too long. Remember what Bill Plympton taught us: Keep it short, keep it funny! Every time they bring up Bill and Sue Kroyer, I have visions of sitting in the Odeon theater and seeing Technological Threat for the first time. Huh. So that's what Pinky and the Brain look like. Next year, need to download the program before the ceremony. "the right voice can make or break a cartoon..." Wow. That one statement needs to be hammered into the consciousness of every director (he said after watching one too many bad English dubs). "We love you Brock Sampson!" All the films in the Best Independent Feature category look so amazing! Fortunately, I've seen Ce Magnifique Gâteau and will see MFKZ, Ruben Brandt, Collector, and Tito and the Birds at TAAFI this month. And Japanese animation gets some well deserved recognition. I can't wait to see Mirai. Once it's released on DVD, I must bump it up on my list of features to watch.